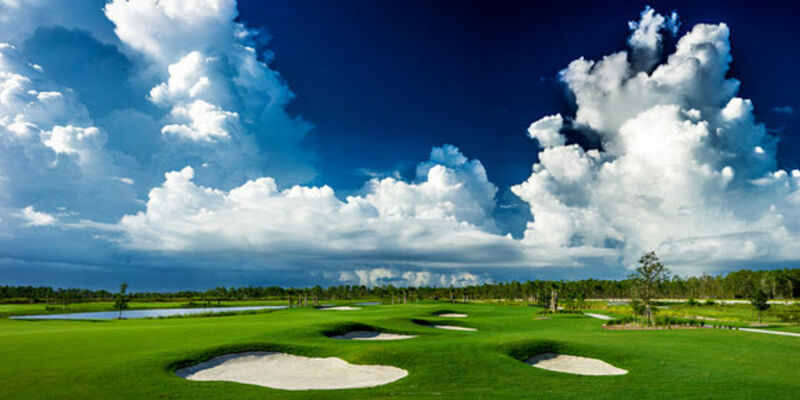 There’s a wealth of good golf around Naples, FL. Only trouble is that most of it resides in private golf communities where access is limited. But greatly helping the cause of trunk slammers with Midwestern license plates is Esplanade Golf & Country Club. It’s a centerpiece of a large community development—still in its early stages—by Taylor Morrison. Opened in March 2014, Esplanade is the design child of Ann Arbor’s Chris Wilczynski, a member of the American Society of Golf Course Architects and a graduate of Michigan State’s Landscape Architecture program (1994). Before opening his own shop—C.W. Golf Architecture—Wilczynski spent 19 years working in a variety of capacities for noted course architect Art Hills who knew Chris’s father, a course superintendent in the Toledo area. During that period, Wilczynski ascended the ranks in the firm and became one of the Hills’ top architects, working on 20 courses primarily in the western part of the United States. The course at Esplanade, as well as a similarly named course in Sarasota for Taylor Morrison, are Wilczynski’s first two solo design efforts. After playing it recently with some Michigan cronies, Esplanade warrants that ringing assessment. I could save readers some time here and leave it at that; but bear with me as I share a few thoughts about why Esplanade and Chris Wilczynski are deserving of your attention. In spite of the “pardon my dust” appearance for the housing community itself, the golf course is handsomely landscaped and “finished off.” Although the turf is naturally still young, it’s on schedule and maturing well. The same may be said for the greens which were, as expected, a tad slower (on the day we played) than found at more established courses. More on the greens later. But the charm and appeal of Esplanade is its user friendly playability. The fairways are wide and generous, the modestly contoured and large greens have open and flat approaches, bunkers are shallow, and water hazards are lateral and not overly penal. You have to hit a very poor shot to lose a ball here. These benign attributes were part of the overall game plan for the layout, shared by the developer and the architect alike. And the big picture is the golf course at Esplanade. Besides a comfortable starting hole to get the round moving along, I liked the variety of the golf holes. There’s a good flow and rhythm to the course with no sudden stops by awkward or ill-fitting holes. In particular, I liked the short par fours found on both nines. The well-bunkered par-four 5th hole is only 336 yards at the tips but poses intriguing choices at the tee box. One can play it safe by hitting a fairway wood or hybrid to the fatter part of the fairway and still only have a wedge or short iron into the green. Or a big hitter can go for the green, cutting off the angle by flying a cross bunker short of the green. In fact, on the day we played, the only birdie recorded was by a player hitting driver leaving him a short pitch to the pin. In testimony to its mettle, playing the hole safe resulted in pars and bogies for the other players. A similarly smart short par four is found on the 14th hole. Despite a few raw and dusty cart rides getting to holes 15 and 17 due to the routing through the new and prospective housing community, Esplanade ends on a high note with the par-four 18th. Not overly long, it’s a challenge to find the optimum angle into the green. The best approach is down the left side of the fairway where drives must avoid the lateral water hazard and some bunkers on the fairway’s edge. The conservative play is toward the wider and right side of the fairway yet it leaves a trickier second shot to the raised green. The green complex is angled against that approach and also boasts an intruding bunker. In sensible forgiving fashion, there’s an ample bailout area short and left of the green for those wanting to miss that yawning bunker. Said Wilczynski: “I purposely put a lot of space around the left side of the green so golfers still have to chance to get up and down. And I didn’t want the green next to the water either.” Amen to that! Okay, about the grasses and conditioning. Celebration Bermuda grass is used wall-to-wall at Esplanade and Wilczynski is very pleased with the results. “It’s the best grass on the market right now. It stays greener longer and doesn’t go off color.” The greens are Tifeagle which remains a proven and popular grass for putting surfaces. All in all, the course conditions are admirable and meticulously maintained thanks to Superintendent Evan Fisher and his staff. The Esplanade course is set within 1,800 acres of spacious land including 170 acres of lakes and over 1,000 acres of wetlands and preserves. When it’s completed, the community will feature over 1,200 single-family and coach homes, lighted tennis courts, fitness center and pool, and clubhouse. The current practice complex consists of a putting green and an aqua range, where golfers counterintuitively hit warm-up shots into a man-made lake. Due to Esplanade’s smart and polite design, those may be the only shots finding the drink here. For an aspiring and talented architect like Chris Wilczynski, that’s music to his ears.